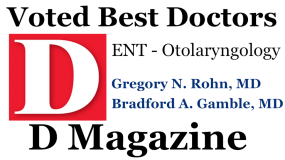 The audiologists at Otolaryngology Specialists of North Texas are specially trained to evaluate hearing ability in the pediatric to geriatric population. Different testing techniques and equipment are used for different ages and abilities. 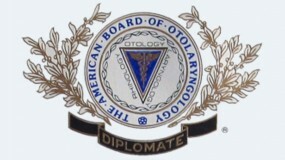 Otoscopy is the visual examination of the ear canal and tympanic membrane through the use of an otoscope. The otoscope provides a bright light and magnification so the ear canal and tympanic membrane can be fully appreciated. This procedure helps the audiologist determine the condition of the ear canal (dryness, excessive cerumen, etc) and the tympanic membrane (perforation, retraction, otitis media, etc). 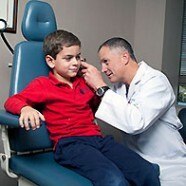 It takes a practiced eye to pick up these conditions, but otoscopy is an integral part of the hearing evaluation. Audiometry is behavioral testing used to measure hearing acuity for sound intensity and pitch. This is the hearing testing people generally think about where you push a button whenever you detect a sound is present. An audiometer is used to generate pure tones at various pitches and intensities. The level at which a person can hear the tone 50% of the time is marked as their threshold at that pitch and intensity. The range of pitches (frequencies) generally tested range from 125Hz to 12,000Hz and the intensities range from -10dB up to 120dB. Pure tone testing allows our audiologists to see how well a person can hear at each pitch. Testing is completed using air conduction (an insert earphone placed in the ear canal) and bone conduction (an oscilator placed on the skull). These two different methods of testing help the audiologist determine if the hearing loss is sensorineural, conductive or mixed in nature. Speech testing is also completed in quiet and with background noise to assess a patient’s ability to distinguish speech. Words or sentences are presented to the patient and the audiologist records the accuracy with which they can repeat the words. Two individuals may be able to “hear” exactly the same, but their “understanding” may be significantly different. Tympanometry is an objective test of middle ear function which evaluates the tympanic membrane (eardrum) mobility and condition of the middle ear. Pressure is applied against the tympanic membrane and the amount of deflection is measured. This testing indicates if the tympanic membrane is intact or perforated. It also measures the ambient pressure of the middle ear space to reveal if the tympanic membrane is in a normal position, has negative pressure (pulled inward) or positive pressure (pushed outward). This test is helpful in diagnosing middle ear infections, tympanic membrane perforations, Eustachian tube dysfunction, disarticulation of the ossicles and many other conditions. Acoustic reflex is an involuntary muscle contraction that occurs in the middle ear of mammals. When presented with a high-intensity sound, the stapedius and tensor tympani muscles within the middle ear contract, which stiffens the oscicular chain (3 tiny bones in the middle ear). It is thought that this contraction helps to protect the inner ear from exposure to loud sounds, but not all the research is conclusive as to why this reflex occurs. Most normally functioning ears have an acoustic reflex when a suitably loud sound is presented. An absent reflex could be indicative of trouble with the tympanic membrane, middle ear system or central nervous system. 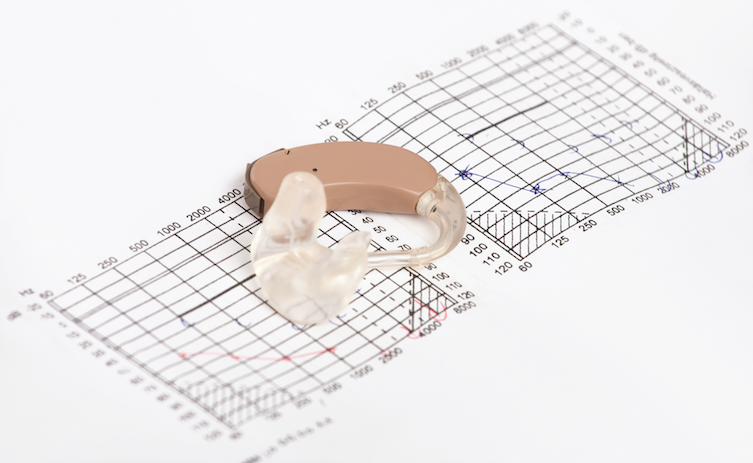 Otoacoustic emissions are a wonderful tool the audiologists at Otolaryngology Specialists of North Texas use to evaluate the cochlear function of very young children. 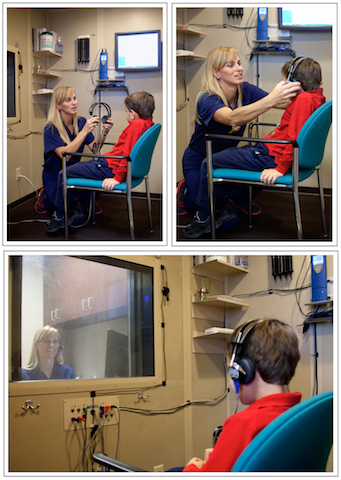 This is an objective measure, so there is no response required from the patient and therefore perfect for infants or other patients who may be difficult to evaluate using standard audiometry. Otoacoustic emissions are low-intensity sounds emitted by functioning cochlear outer hair cells. Distortion product otoacoustic emissions are measured by presenting two simultaneous tones of different frequencies to the ear and then measuring the resulting emission that is produced in the cochlea. Normal emissions are obtained if the hearing thresholds are 30-40 dBHL or better, or if the middle ear system is not compromised (otitis media, etc). The OAE test does not quantify hearing threshold level and does not assess the integrity of the neural transmission of sound from the auditory nerve to the brainstem. 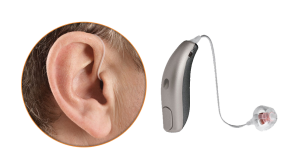 Hearing aid evaluation or an audiological evaluation is conducted following a careful patient history and examination by the audiologists and otolaryngologists of Otolaryngology Specialists of North Texas. Audiologists, Mary Gamble and Lisette Jackson, Au.D., CCC-A and otolaryngologists, Dr. Rohn and Dr. Gamble of Otolaryngology Specialists of North Texas are highly experienced and uniquely qualified to identify a wide variety of pathology and underlying medical conditions of the hearing and balance systems. If you would like to schedule an appointment with our office, please call our Plano office at 972-378-0633 or Dallas office at 214-239-1641.